The 1975 Plymouth Gran Fury Brougham two-door hardtop listed for $5,959 f.o.b. Windsor, Ontario. The posh pillarless Plymouth model was imported from the US. The Plymouth Division of Chrysler Canada traditionally took a large part of the domestic market, because Plymouth represented real value to consumers. As imports and domestic compacts crowded the highways in the 1970s, Plymouth added a captive import, an intermediate and a domestic compact to compliment its full-sized lineup of cars. As a result of the additions to the lineup, the Plymouth nameplate continued to hold its place in the market. Despite its advanced age, the reliable Plymouth Valiant was the second most popular selling car in Canada in 1974; the intermediate Plymouth Satellite ranked Number 18 in sales with 18,619 units delivered and the Plymouth Fury held the Number 23 slot in sales with 16,375 units delivered. 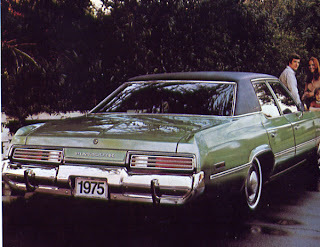 For the 1975 season Plymouth’s full-sized models were all named Gran Fury. There was a Gran Fury Special, A Gran Fury, a Gran Fury Custom and a Gran Fury Brougham. 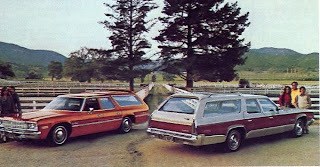 In the station wagon sector there was a Gran Fury Suburban, a Custom Suburban and a Sport Suburban. The 1975 Plymouth Gran Fury four-door sedan carried a sticker price of $5,434. It weighed in at 1932 kilos and rode on a 3 098-millimetre wheelbase. No finer Plymouth could be had than the ones in Brougham dress. The two-door hardtop, the two-door pillared hardtop and the four-door hardtop was deliverable in any one of 19 body colours and seven vinyl roof colours. The elegant Brougham carried its own distinctive grille and rear. It sparkled more than other Gran Furys because of its special wheel covers and the jewel-like medallion that stood proud and tall on this flagship of the Plymouth fleet. The 1975 Plymouth six-passenger Gran Fury Custom Suburban wagon (left) sold for $6,015 and the nine-passenger Gran Fury Sport Suburban wagon cost $6,445, making it the most expensive Plymouth in the lineup. Included in the base price of the upscale Brougham were such goodies as the 360-cubic inch V-8 mill, the Torqueflite automatic transmission, power steering, power front disc brakes and the steel-belted radial tires. Inside the posh and cavernous cabin one could expect a tailor-padded steering wheel, deeply cushioned seating upholstered in splendid cloth and vinyl combination fabrics and a centre armrest. Interior colours were Blue Green, Burgundy, Gold, Black or Parchment. On four-door models, the front passenger’s seat reclined. The Gran Fury Custom promised to be the big car with the price found on many smaller cars. Available as a two-door hardtop, four-door sedan or four-door hardtop, the Custom added “dramatic value” to what was already a spacious and luxurious interior. 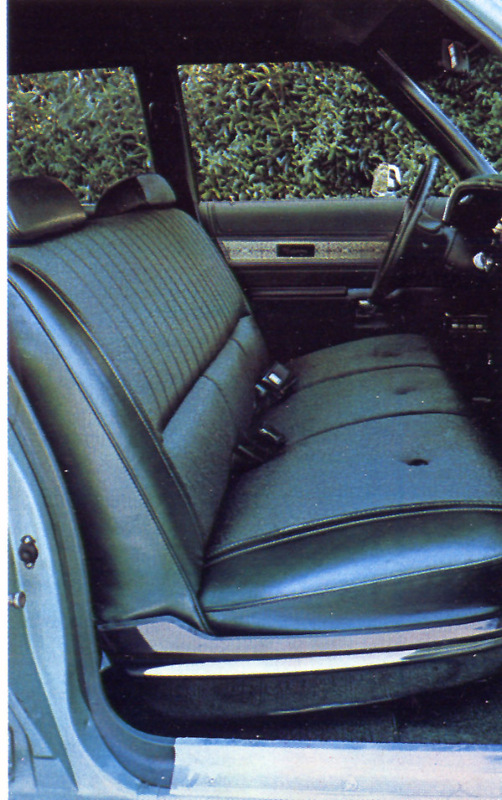 The standard cloth-and-vinyl bench seat could be upgraded to optional all-vinyl buckets replete with a centre armrest. It boasted features like a padded steering wheel, electric windshield wipers and washers and a coin holder. Attention was drawn to the flush-fit door handles--like those of AMC’s Ambassador--a safety feature that prevented doors from flying open in the event of a rollover. Another feature of note was the many different types of noise deadeners placed between passengers and the road. 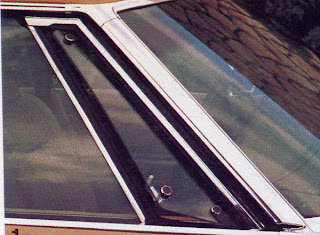 Available on Gran Fury models only was a “manual vent window” that aided in interior airflow. The extra-cost item was popular with smokers. Passengers appreciated the gently contoured seats, the tailor-padded steering wheel and the modular concept instrument panel with individually removable segments for minor service—“if ever necessary.” All operating controls were placed to the left of the driver while all comfort controls were positioned to the driver’s right. 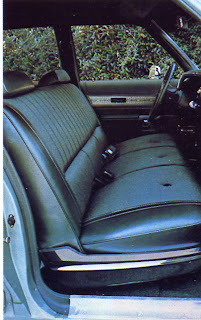 The cloth-and-vinyl bench seat interior for the Gran Fury Custom was attractive and comfy, too. There were more options for the senior Plymouth than there were moose in the forest. Gran Fury could even be ordered with a manual vent window to aid in air circulation. A fuel pacing system flashed a light on the dash when the driver’s foot got a little two heavy on the gas pedal. There were enough radios to fill a shelf at a Zeller’s, including an AM model, an Am/FM radio, an AM with an 8-track player and an AM/FM stereo an AM/FM with a stereo 8-track player. Offering no mere electric clock, the Gran Fury boasted an extra-cost digital Chronometer that promised to keep accurate time within a minute a month. An integrated centre bucket seat console, speed control with memory, Air Temp II air conditioning and tinted glass, trailer towing packages, numerous wheel covers, chromed styled road wheels and tires were on the list. There was the tilt-and-telescope steering wheel, a sunroof, an electric rear-window defroster, electric windows, an inside hood release, power seats, power steering, a tachometer for two-door model, undercoating and more. Exterior colours for the Gran Fury were Spinnaker White, Formal Black, Spanish gold metallic Frosty Green Metallic, Deep Sherwood Metallic, Silver Cloud Metallic, Vintage Cloud metallic, Bittersweet Metallic, Avocado Gold Metallic, Sahara Beige, Cinnamon Metallic, Aztec Gold Metallic, Lucerne Blue Metallic, Golden Fawn, Inca Gold metallic, Powder Blue and Sienna Metallic. Colours exclusive to the flagship Gran Fury family were Platinum Metallic, Astral Blue Metallic, Dark Chestnut Metallic and Starlight Blue Metallic. A close-up view of the 1975 Plymouth Gran Fury instrument panel shows the faux wood appliqué and the extra cost digital Chronometer. Chrysler Canada was good at crowing about its engineering features. The Plymouth made use of more than 4000 welds in Unibody construction and then dipped the bodies seven times to inhibit rust. The Torsion-bar Suspension System gave a unique ride on road surfaces. The company reminded prospective customers Chrysler was the first domestic manufacturer to offer disc brakes. The Electronic Ignition System eliminated points and condenser, too. When the dust had settled on the sales year, Plymouth’s Valiant had dropped to the Number Three spot behind the full-sized Ford with 33,842 units delivered. The now intermediate-sized Fury racked up 20,302 sales to move it from the 20th spot to the 18th position. The Gran Fury had 14,333 sales to its credit for 19th place. That placed the full-sized Plymouth three notches higher than last year, though 16,804 units had been delivered in 1974.